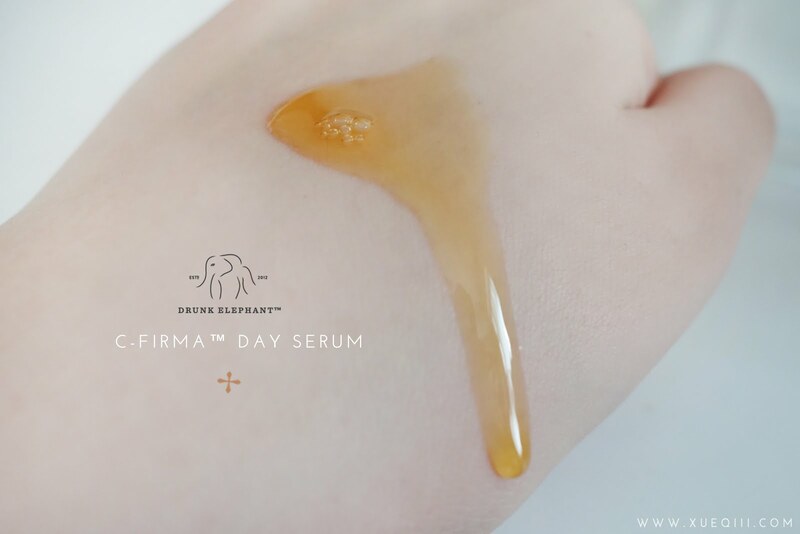 Drunk Elephant's highly raved serums - T.L.C. 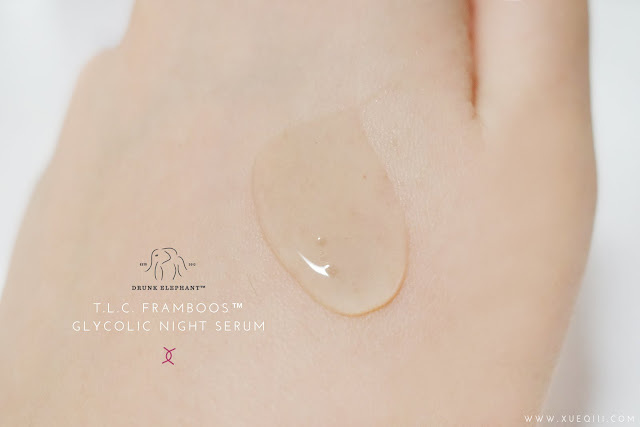 Framboos™ Glycolic Night Serum $90 and C-Firma™ Day Serum $80. Took the plunge and purchased these 2 serums from Drunk Elephant. And I am so glad that I did! I have been on the hunt for a good serum as I have been experiencing tons of texture especially on my cheeks. 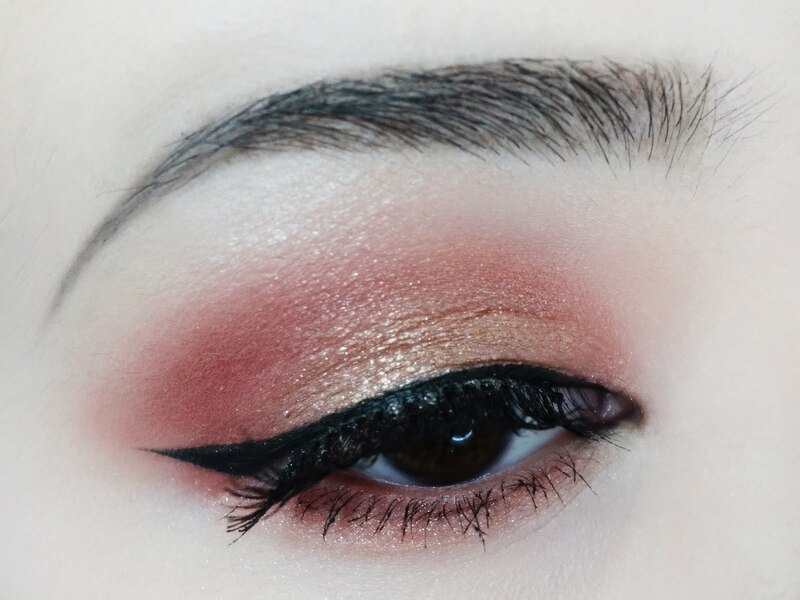 Makeup just doesn't look good on top of all the bumps. Very sturdy packaging great for travel. I like that it has an opaque casing to prevent sunlight from coming into contact with the product. Hence the product will last as long as it can. Do note that this is TWIST cap. Don't pull on it or you will rip the entire cap off together with the product. This brand is not available in Singapore. So I ordered this directly from their website and shipped it to Singapore via Comgateway. You can use any 3rd party redirecting service you like. 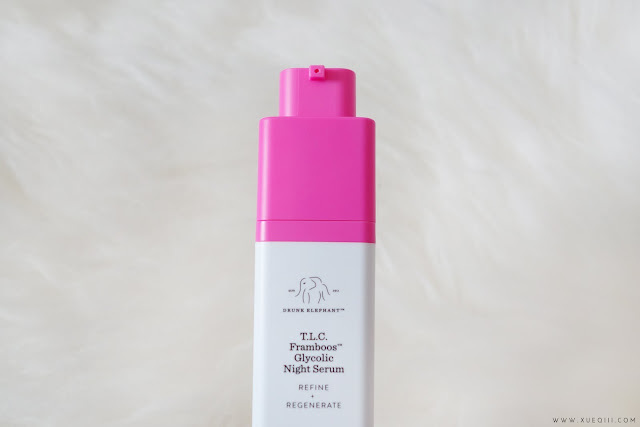 A little introduction on the brand, Drunk Elephant is a non-toxic skincare brand founded by Tiffany Masterson. 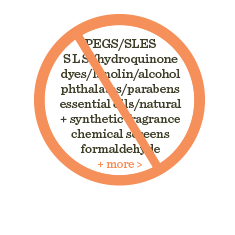 There is no fragrance added in ALL their products. The scent is basically what the ingredients smell like. The name is rooted in a myth that says elephants love to eat the fruit that has fallen from the Marula trees - fermentation then occurs in their tummy and the elephants become drunk! How cool is this. A 12% AHA/BHA blend for night that refines and resurfaces skin by gently dissolving the glue that holds dead skin cells to the surface and increasing collagen production, revealing an even-toned and radiant complexion. Enhances the performance of other products by clearing the way for maximum absorption. Fine lines, wrinkles, hyper pigmentation and other signs of aging will be greatly diminished, along with excess oiliness, acne and the appearance of pores. Chemical Exfoliation - Glycolic, Lactic, Tartaric, Citric and Salicylic Acids and Raspberry Extract. Calm, Brighten and Protect - Horse Chestnut and White Tea. Suitable for all skin types. The pH level of T.L.C. Framboos™ is 3.8-4.0. Twist cap to reveal pump. At night, apply to a clean, dry face, neck, chest and backs of hands, avoiding the eye area. Shake well before use to reactivate the gel. Also works incredibly well as a spot-treatment! In the early stages of using this product, you might notice some mild tingling, itching or stinging, but this typically dissipates as your skin becomes adjusted. Start slowly. Use the product every other day, alternating with Drunk Elephant Virgin Marula™ Oil as necessary. For those with acne prone skin, the use of glycolic acid may increase blemishes for the first few days.This is normal and represents a cleansing of clogged pores. I have been using the night serum for a month so far and it has made such a huge difference on my skin's texture. For the first week, I used it every single night and I begin to feel improvement on the 3rd day - the bumps underneath my skin were getting smaller and lesser. However, this product is not recommended to be used on a daily basis as it will dry out your skin. I experienced a little bit of dryness on my cheeks and sides of my nose towards the second week. I switched to using this only 3 times a week and it has been doing a pretty darn good job! One month of use will probably not create miracles but it did made my skin more plump than before (collagen perhaps) and most importantly is the textured bumps on my checks - they are pretty much gone! I still have a few stubborn ones here and there but it is so much better than before. Highly recommend this product if you have textured skin concerns. A super potent Vitamin C day serum packed with a powerful antioxidant complex, essential nutrients, fruit enzymes and an anti-aging ChronoPeptide that transforms into Vitamin D, all working together to firm and brighten skin, while preventing and correcting photoaging, replaced by incredible radiance and luminosity. In the AM, apply evenly to clean, dry face, neck, chest and backs of hands. Immediately follow with your favourite sun screen. The C-Firma™ formulation has a reservoir effect, which means it will stay active on skin for up to 72 hours and cannot be washed or rubbed off. Also may be smoothed over hair for extra shine and manageability...only a few drops will do the trick. This showed results on my skin as well. 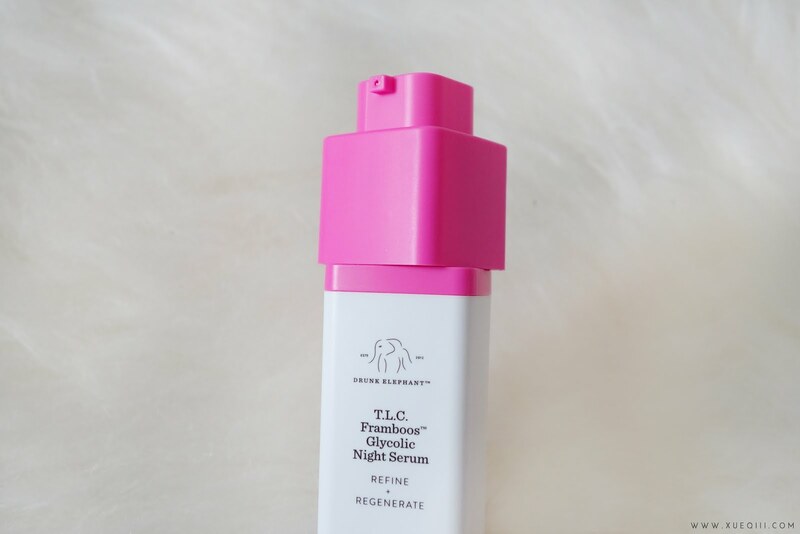 I use this on a daily basis no problem - doesn't dry out my skin or make my skin sensitive. I always make sure to layer sun screen on top of this serum - Bioré UV Bright Face Milk with SPF 50+ PA++++. The Bioré sun screen feels very light weight and on days where I don't put on makeup, I just slap this on to brighten my complexion. For combination and oily skin peeps, I recommend the Perfect Face Milk (in a white bottle) that gives you a matte finish. My fresher blemish spots and scars have lightened a ton. I no longer need to layer on a full coverage foundation on my face. As for the older scars and hyper pigmentations, I guess I will need to use this for a longer time to see any life changing results. But so far so good! I have also noticed an overall brightened complexion. When I was suffering from breakouts, my complexion was so dull and without makeup I look so aged and tired. 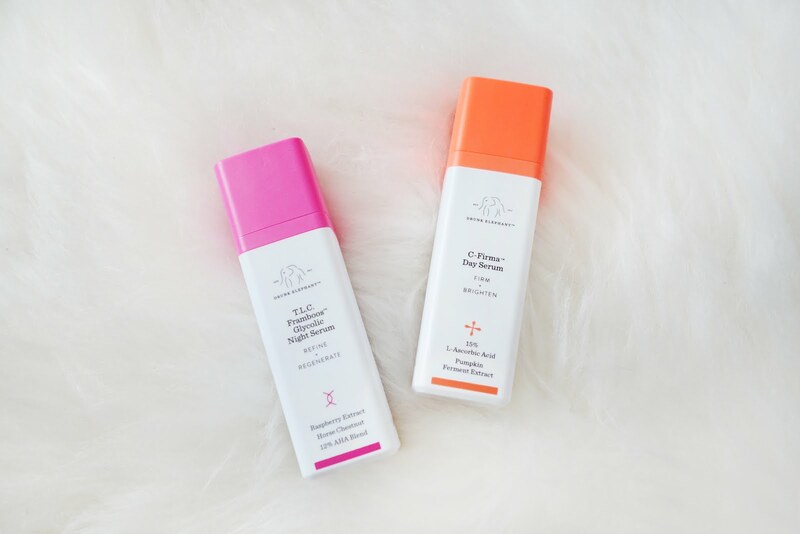 Overall I'm a huge fan of these two serums and I will continue to use them, let me know your thoughts and experience with Drunk Elephant in the comments below. I was actually contemplating between the Drunk Elephant serums and the Sunday Riley Good Genes and Luna Night Oil. I will probably switch to Sunday Riley after I am done with these two. If you have used Sunday Riley products before do let me know how you feel about them! how much was the total cost plus shipping and other fees? Total was $170 USD and there was free local shipping within US. I used a forwarding service to ship my US buys to Singapore so it's hard to determine the exact int shipping fee but it should be around $20 depending where you are. Hope this helped! hi sorry am a noob ...what forwarding service did u use? Hi xueqi! You mentioned in your post that you used the night serum 3 times a week, what abt on the other days? 😊 What product do you usually use?would it be suitable for Normal / combi skin like me? Thanks a lot! Hi, this is a very informative review! :) Thanks for giving us insights on this brand. May I know why you would switch to Sunday Riley after you are finished with these 2 serums from DE? The Vitamin C serum looked really promising~ and I am wondering if I should buy it. Is there something wrong with these products eg. you are experiencing an adverse reaction or not getting the promised results, that you stop using them? i would like to order the items, would you like to share the shipping fee? Drunk Elephant and Glossier products, now available at Carousell! Upper back pain is a fairly uncommon type of spinal problem, but it can be one of the most painful. There are many CBD oil for back pain of upper back pain, including a specific injury, such as falling down or tripping; trauma, such as involvement in a car wreck; or years of bad posture, often accumulated from working at a desk all day.